Sometimes films come along at just the right time. In a time in which people need an entertaining escape from present realities and the world needs positive messages about unity, Paramount Pictures couldn't have timed this release any better. Maybe it’s partly for the timeliness, but I can honestly say I haven’t walked away from a movie quite so affected all year. One of the things that attracts me to science fiction tales in which humanity meets and interacts with aliens is that often they involve an idealized future in which humanity works together in unity or finally learns how to do so. In such a scenario, we have to accept that we are no longer a collection of different races and countries. We are the human race, and we have to finally put our petty differences aside in order to work together. Needless to say, given the current state of things, this is something we could all stand to reflect on. Yet Arrival is about more than just this. It so effectively reflects our culture and news media’s reactions to things that it should, at least initially, disturb us. The horror here is what we see of ourselves playing out onscreen. It shows us what a believable response to a first encounter might look like. Denis Villeneuve is brilliantly effective in his use of methodical pacing to set up and immerse the audience in this disturbingly familiar world. 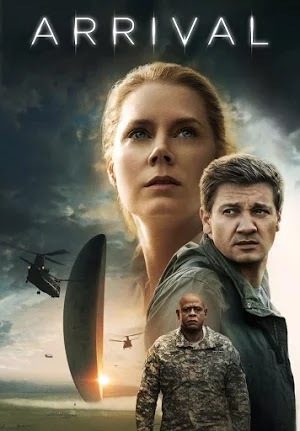 In much the same way we followed the events of Sicario from the perspective of Emily Blunt’s character nervously preparing and ultimately traveling into dangerous territory, here we follow Amy Adams’s Dr. Louise Banks as she is brought in to help translate an alien language. Banks is the country’s foremost linguist, and she must work with the military and scientist Ian Donnelly (Jeremy Renner) to learn the alien language in order to discover their intentions. Amy Adams gives an affecting performance that will stay with you long after you’ve left the theater. Her Dr. Banks is fleshed out through a series of joyful, yet painful flashbacks with a young daughter she lost. These memories serve the greater purpose of reminding Banks of the teachable moments she had with her daughter. It instructs us, along with characters in the film, in the ways humans communicate, the things we may be inadvertently saying, and the traps we may walk into when learning to communicate with people who think differently than we do. In fact, importantly, language and our approach to teaching it can reveal one’s manner of thinking. That plays an interesting role in working with the aliens, but also in examining the ways in which other cultures address the aliens (12 ships landed in different countries around the world). The issues that complicate this alien encounter are humanity’s lack of unified leadership, distrust of one another, and ultimately our inability to work together. All of this puts an unnecessary time constraint on Dr. Banks’s efforts to discover their true intentions. Both the science fiction and the real science employed here is modern and grounded in satisfying ways. The alien ship, the squid-like aliens themselves, their language, and how Dr. Banks and her team get to them are excellent examples of the science fiction genre. And the exploration of language learning is one of the most fascinating, if underexplored, elements in the film. Villeneuve proved to be a master of tone and tension with Sicario, a film whose slow deliberate pacing had me on pins and needles throughout. The effect is similar here, using excellent sound and production design, Bradford Young’s beautiful cinematography, Jóhann Jóhannsson moody music, and effective performances to amplify every moment. And all of these elements are unified by Denis Villeneuve's strong direction and excellent artistic vision. I’m not sure there is another director working today that can so effectively immerse an audience in the worlds he creates. It’s Villeneuve’s meticulous eye for detail, both in the story and the filmmaking, that keep it grounded and suspenseful. Each new detail serves as a building block to a greater whole. Yet I’d be remiss if I didn’t praise the source material, “Story of Your Life” by Ted Chiang. Admittedly I haven’t read it (though I’m hoping to), but it contains all the moving themes upon which Arrival is built. I like this cerebral approach to science fiction, and I have a soft spot for tales of reckoning with time and memory; two of the most powerful forces humanity must contend with. But when it comes down to it, Arrival is about what it means to be human. What it ultimately makes us ponder is, what is the human experience, and is it worth all the love, joy, pain and loss we inevitably experience. How can patience, empathy and communication make us better? It’s impossible not to be impressed by the sheer craft of filmmaking, but for some it may sag in the middle while winding up for a twisty ending that expresses much of the film’s most moving themes. And there may be one or two minor, nitpicky issues I can’t discuss without spoiling things. But it’s all easily forgivable considering the strength of the beginning and ending. This is one of the best films of the year and it couldn’t have come at a better time.